Quality reproduction of original Harley motor case drain plug / oil pump body plug. Motor case drain plug for Big Twin cases 1911 – 1970. Oil Pump Body Plug for Big Twins 1968-1984. Thread pitch is 3/8" X 24. Replaces OEM #'s 453-11 and 700. 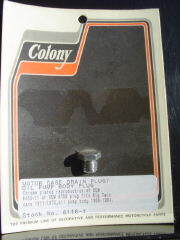 Colony Stock #'s 8116-1 and 8117-1.